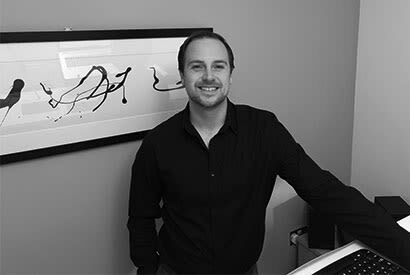 Ever since the introduction of the Google Panda Penalty into their algorithm (see Josh Bachynski’s website for the full list of factors), duplicate content and pages with little to no unique content have been penalised heavily within Google. Entire websites have been filtered out overnight with a complete drop in Google traffic from this problem alone. On the Amrita Nutrition website there are countless examples of this happening, from brand pages that have direct copies of the manufacturers bio (such as in the image above), to pages with a title and a list of products and nothing else on the entire page. 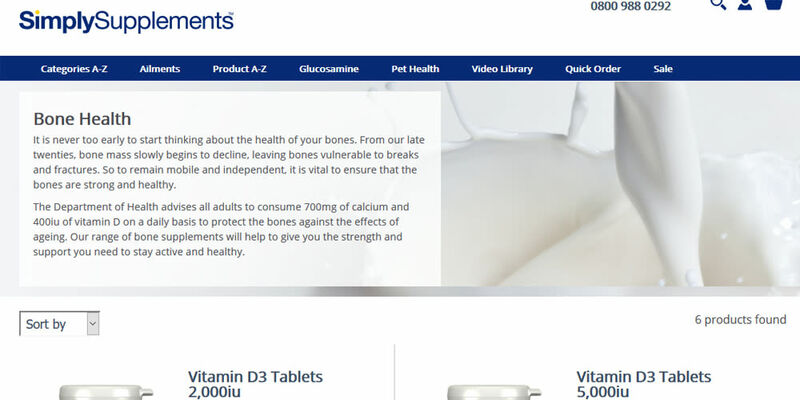 An example of the thin content pages is for the keywords around “Bone supplements”, where the Amrita page has a title and a list of products, and ranks on page 2 for “buy bone health supplements” which is what their page title is optimised for. Calculate the most profitable / easy to rank keywords and fully optimise their landing pages with unique, relevant content. Add internal links to these high priority pages from within the main content of pages with inbound links. Build inbound links to these pages through link building campaigns. 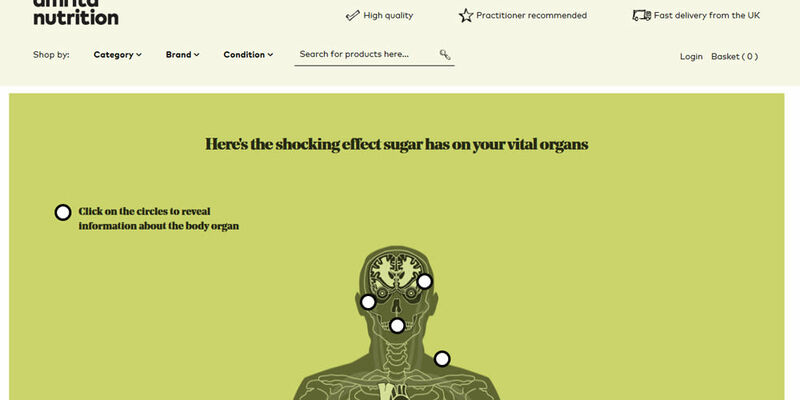 Back in March 2017, Amrita Nutrition published a very impressive interactive infographic on the impact that sugar has on the body. It’s a great piece of content, with lots of useful information that is perfect for baiting companies into covering it and linking back to the page. It worked to some degree, with the Dailymail.co.uk covering it in a full piece and linking back to their web page which displays it. However they’ve forgotten to utilize this now important page. There are no internal links going out to related products or categories on their website from the main body of the page. This means that Google is not fully spreading the authority gained from those inbound links to pages that Amrita actually wants to rank and make them money. It’s also a fantastic branding opportunity to impress visitors, but despite this has 0 internal links pointing to it on the entire website! This means that no visitor could find the page even if they wanted to. Add a small text introduction at the top of the page with internal links to the most important categories of the website. 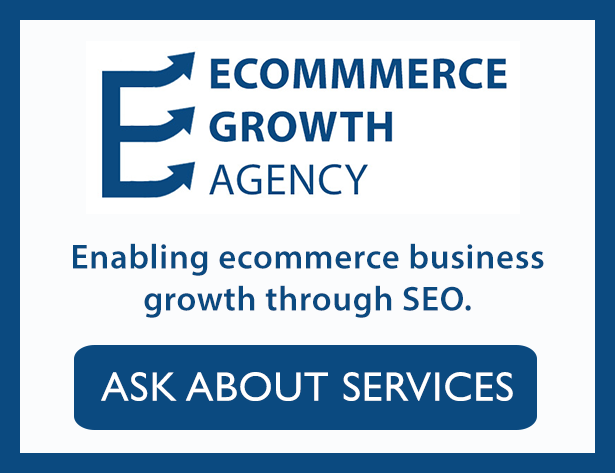 Add internal links to related products within each section of the infographic that Google can crawl. Add a link from the blog section / create a resource section and link to it from the feed and potentially a spot on the homepage. So when you create your brand new website, one of the most important things to consider for SEO is to maintain the url path going from old to new. 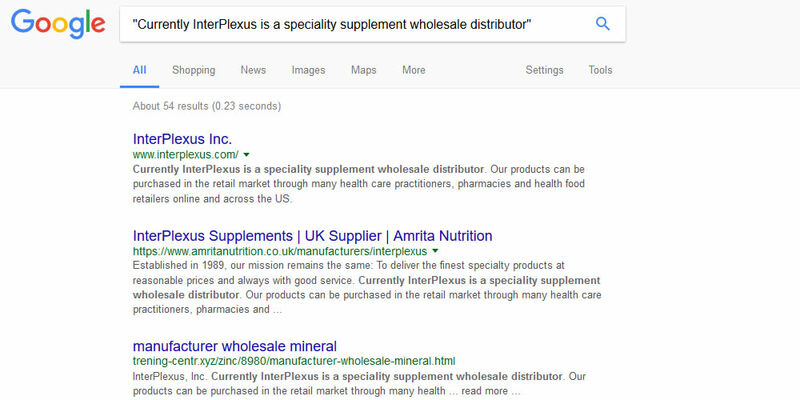 However when looking at the broken inbound links pointing at the Amrita Nutrition website we can see that this was missed. 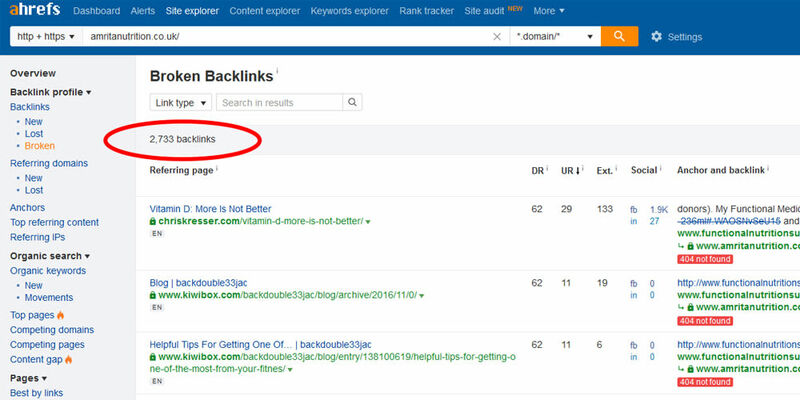 For both users and for the websites overall rankings, 2,733 broken backlinks is a big deal, and should be 301 to their relevant page on the new domain, or at the very least the homepage. This will improve the user experience for visitors of old links, and improve the website rankings by maintaining previous authority from those inbound links. On a side note, they also have 168 internal 404 errors that should be fixed, which include missing images in product carousels and page links. 301 redirect all broken pages to their most relevant equivalent on the new domain name. Fix internal broken urls via re-upload of images or redirects. There are far more things wrong than just these 3 points, however they can be covered another time. The site is far from bad, the keyword research is exceptional, with pages created for every possible angle of buyer intent you could think of. However there are fundamental SEO mistakes that once fixed could significantly increase their traffic from Google. If they could go that slight extra mile with introductory content + deep sub-categories on key product types, their traffic could increase significantly. One of their biggest issues is the lack of authoritative and relevant inbound links, but again that’s a topic for another time. Remember if you’re struggling and want me to help improve your organic rankings, then consider a tailored SEO audit or a consultation. Thank you for posting. It was interesting to see the power of the AHrefs tool and the fact that you can identify all the broken links on the website. Have you seen any similar free tools that can do the same? As it seems, all the relevant ones out there only provide information on up to 2000 links and then require some kind of subscription. Your thoughts would be greatly appreciatted. Not that I’m aware of I’m afraid John. They do have a free trial that you could look into.